M. Tegeler, O. Shchyglo, R. Darvishi Kamachali, A. Monas, I. Steinbach, G. Sutmann. Simulation of normal grain growth with 240000 initial grains. 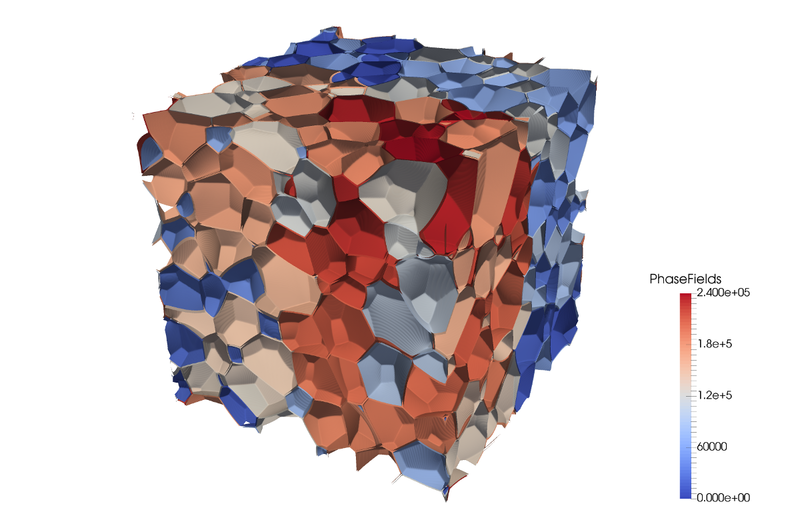 The open-source software project OpenPhase allows the three-dimensional simulation of microstructural evolution using the multiphase field method. The core modules of OpenPhase and their implementation as well as their parallelization for a distributed-memory setting are presented. Especially communication and load-balancing strategies are discussed. Synchronization points are avoided by an increased halo-size, i.e. additional layers of ghost cells, which allow multiple stencil operations without data exchange. Load-balancing is considered via graph-partitioning and sub-domain decomposition. Results are presented for performance benchmarks as well as for a variety of applications, e.g. grain growth in polycrystalline materials, including a large number of phase fields as well as Mg–Al alloy solidification.